Recently I was approached by the folks at Kernel Season's and they asked me if I wanted to review a few samples of their popcorn seasonings. I'll be honest and say that at first I wasn't quite sure that my readers would be all that interested, that is until I saw their great array of flavors. 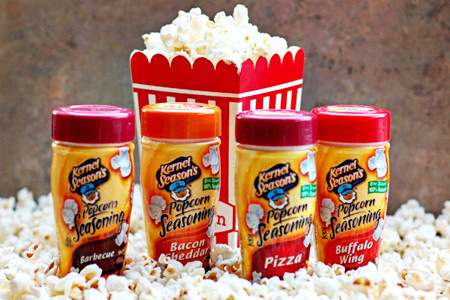 One look at their list of flavors makes it very obvious that these aren't your average run-of-the-mill popcorn seasonings. With flavors like barbecue (hello! ), buffalo wing, jalepeno cheddar, bacon cheddar, and pizza, how can a guy possibly go wrong? They sent me four flavors -- barbecue, bacon cheddar, buffalo wing, and pizza. I tasted each flavor straight from the jar and I thought that they were all very true to their name, but of course the real test would be on popcorn. We tried them all in various batches of freshly popped corn. I popped a few quarts of fresh corn using peanut oil. A great method is to heat the oil in a large pot, covered, at just over medium heat with just four or five kernels in the oil. Once those kernels pop, move the pot off of the heat for about thirty seconds. At that point pour in the corn (about 1/2 cup to 3 tablespoons of oil) and return the pot to the heat. Cover the pot with the lid tilted to vent some of the steam. Shake the pot on the burner every few seconds. Most of the corn will pop within about a minute or so. You'll know it's done when there are several seconds of silence between pops. When you reach that point, immediately pour the corn into a large bowl. Using this method you will notice that there are very few un-popped kernels and very little, if any, burned corn. As I mentioned, we tried the seasonings a few times and we enjoyed each, with the exception of the buffalo wing flavor. That was just too potent, and the vinegar flavor shot straight into our nostrils in an off-putting way. It mellowed a bit as we ate it, but it was definitely our least favorite. Our overwhelming favorite was actually a blend of the barbecue and bacon-cheddar. That was some serious cheesy, smoky and slightly sweet popcorn bliss. Blending flavors really is a great way to use Kernel Season's. You can create your own signature flavored popcorn with just a few shakes of this and that. Oh, and don't stop at popcorn! These seasonings would be great on French fries, tater tots, baked potatoes, or anything else that could use a blast of flavor. I think that some homemade potato chips would be an outstanding canvas for these seasonings. Shoot, I'd bet that some would even be a great on meat headed for the grill. Overall we really enjoyed the Kernel Season's product and I recommend them. Disclaimer: The seasonings were provided to me free of charge for the purpose of this review, but the thoughts expressed are entirely my own. Come on John you haven't turned anything down that was free right? Have you had any bad reviews of any free product? scoop up the free stuff!! Another good review Bam there you go!! Keep the free stuff coming in! Johns rewiews dont mean a hole lot. I am glad you explained how to make popcorn on the stove. I always had a popcorn maker growing up and was unsure how to do it on the stove top. They have some good sounding flavors! Chili & lime, parmesan & garlic...it all sounds delicious! The buffalo wing one is horrible! Burned my nostrils and made me cough, choke and sneeze! Me encantaría poder probarlos,condimento para palomitas,seguro que están muy buenos. I just discovered your blog today, running across it while looking up recipes for grilling now that wintery weather is past. I saw this article and had to comment, as I have been using Kernel Seasons for a few years now because I am on a low sodium diet for health reasons and nearly all their seasonings are low sodium. We actually use these on foods other than popcorn far more often than we use them on popcorn. I noticed a lack of love for the buffalo wing and I thought I would weigh in here on one use that I have found. I love Blazin' Buffalo Ranch Doritos, but my diet doesn't allow them any longer. Mixing the Buffalo Wing seasoning and Ranch seasoning will result in a similar flavor. I take unsalted tortilla chips and spritz them with vegetable or olive oil and then sprinkle them with my buffalo ranch mixture and then pop them in the microwave for about 30 seconds. Done. It can also be done on homemade tortilla chips. Nacho Cheddar and Chili Lime also go well on tortilla chips.